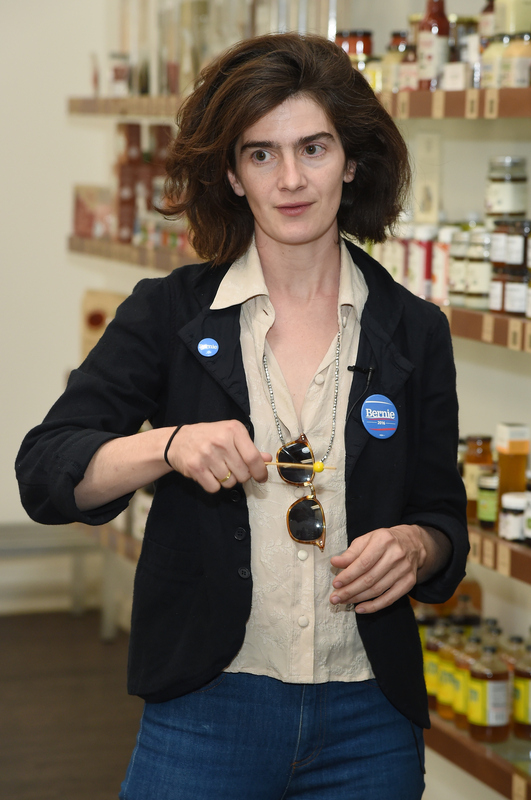 To most Americans, Gaby Hoffmann is probably best known for her Emmy-nominated portrayal of Ali Pfefferman on Amazon's Transparent or for stealing scenes as Adam's eccentric sister, Caroline, on HBO's Girls. Less known is Hoffmann's off-screen political activism. After getting her start protesting the Iraq War while a student at Bard College, Hoffmann has been traveling across the country for Bernie Sanders. Through campaigning in the Iowa and Nevada caucuses and stumping in her home state of New York, she's had her own political realization. She actually sees a commonality in Trump and Sanders' unexpected campaign success. "Obviously, Bernie is to the left. And obviously, Trump is to the insane. He's terrifying. He's a maniac. But what we see in this incredible response is that the establishment in both parties are not doing it for America," Hoffmann tells me when we meet in Brooklyn, the day after she spoke at a Sanders rally in New York City. She goes on to explain that the dual rise of a Democratic socialist senator from Vermont and a reality TV business mogul "shows that America on both sides no longer trusts these two political parties, because they're f*cked. They’re totally f*cked, and they're not doing anything for anybody except a few rich people and their corporations. That’s what they’re designed to do." After years of observing U.S. politics, including how the Democratic party operates, Hoffmann says she's beyond disappointed. During our interview, she describes herself as feeling physically ill with the state of our country and planet. "I just feel we're so sick. This country is sick, and we're all suffering from the disease. And if you think you're not, I think you're mistaken. And I think this is a call to investigate this moral crisis," Hoffmann says. In fact, she says she debated having a child, something she long wanted, because she was so torn at the thought of bringing a human into a world that she found to be in such a sorry, scary state. "I've been excited to have a family since I was young, and I spent a lot of time in my 20s feeling like I didn't know if I could have a baby, because it seemed so scary to bring somebody into this world. I felt so powerless and so hopeless," she tells me. While she's thrilled she had her daughter Rosemary (now 17 months old), "I still don't feel OK, because when I go take a walk with my daughter and walk pass a little boy living on the streets with his mother, I'm not OK. We can't not feel that." And it's partially because she feels so depressed by the present state of affairs in America that she's not only endorsed Sanders, but also devoted her time to making speeches and traveling the country for his campaign. "When I see what Hillary has done — and she has shifted on a lot of stuff recently because of Bernie — historically, she pretty much seems comfortable with maintaining the status quo, and I think we’re stuck," she says. Yet she also understands that this same feeling can explain Trump's equally unexpected rise in popularity. Does Trump's success surprise her? "It does not," Hoffmann tells me, before adding, "I mean, it does because it’s outrageous and disgusting, but on some level, it does not." Trump taps into the same disappointment with the American government's status quo that her chosen candidate does. While Hoffmann tells me she has "pretty successfully" avoided hearing Trump speeches, what she catches of them share a similarity, to a degree, with what Sanders says. "The Democratic party is also failing this country, so when Bernie says the stats quo is not working ... I am pretty sure [Trump] is saying the same thing over there," she tells me. However, according to Hoffmann, that's where the similarities between Trump and Sanders begin and end. "Of course, the difference is the response," she says. "I think everyone has the right to be angry, and people are frustrated, and I think there are two ways you can manifest that anger. One is through compassion and love and unification and turning to true American values ... or that rage and frustration can be manifested as hate and violence, and that’s what we're seeing on [the Republicans'] side." The way the two candidates utilize what she perceives as very real and very legitimate anger makes for a critical disparity in their campaigns. "To me, these are the two huge differences: Donald Trump is using these tactics so he can get in the seat of power and keep maintaining power. He's not trying to empower the people, but he's getting their support by tapping into that anger that they feel." "And what Bernie is doing is tapping into that same anger, but saying, ‘Use that, take that, turn that into a voice you can use to demand representation and democracy and human rights.' He's not manipulating it the way Donald Trump is." Hoffmann could not be clearer that, even though Sanders and Trump both preach promises of dramatic change and upending the governmental status quo, by no means does that indicate that Trump would ever get her vote. "Donald Trump is more egregious than anyone we've seen in my lifetime in this country," she says. "He’s using their anger — not to give them power, but just to give them a temporary outlet so that he can rise to power. Obviously, that is hugely problematic and very upsetting." And she's not a Bernie-or-Bust voter, either. Granted, Hoffmann firmly believes Sanders has a "much better shot" at winning in the general election than Clinton does because he goes against the party establishment. ("He brings out not just all the Democrats who will vote for him but people who wouldn’t have voted otherwise because they had given up on the Democratic party a long time ago.") But if he doesn't nab the nomination, Hoffmann says she will remain loyal to the party — albeit begrudgingly. "I will vote for Hillary," Hoffmann says. "But I won’t be thrilled to."